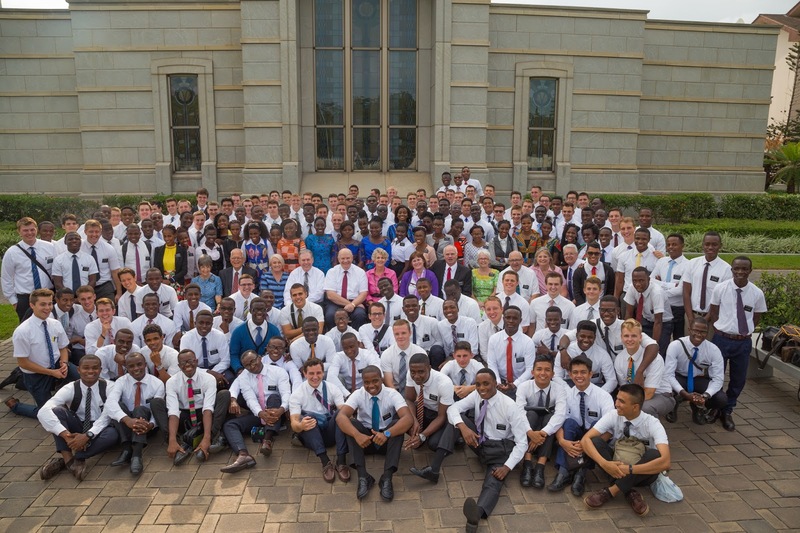 During the first week of August, Elder Renlund,visited Ghana and spoke to all of the missionaries in our mission. This was a good time to take a mission picture. We visited a missionary apartment where the elders had taken off the counter top in an effort to get rid of cockroaches. The apartment is going to be fumigated and a new counter top will be installed. We attended a missionary farewell in the Burma Hills branch to say good-bye to Sheila who is going to serve an eighteen month mission in Jackson, Mississippi. The new missionary training centre (MTC) opened in August next to the temple compound to replace the old MTC which was located an hour away in Tema. 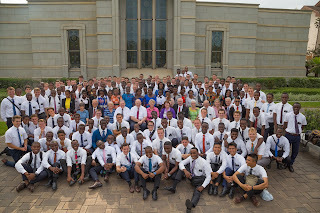 The number of missionaries that can be trained has been increased from 100 to 400/month. In the foyer is a huge mural of the Saviour admonishing his disciples to preach the gospel throughout the world. Numerous art pieces are hung on the walls. Most significant was a wood carving of "Lehi's Tree of Life" using an African motif. I paid this street vendor 60 cents to take his picture because he was wearing a toque on a very hot day! Meg is assembling quite a collection of carvings including a herd of zebras. These three childred loved having their picture taken. After a district meeting we bought the missionaries some drinks for 30 cents each. This fellow was next to the drink vendor sawing a piece of metal so that it could be bent - very laborious! We took some bikes to these missionaries and I had to take this picture of the pink top against the pink house. I have another person to golf with. Chrics Wakild is from Kentucky and is serving in the law department. We attended the Teshie district meeting where we observed some role playing and Elder Daw showed us the washing machine he had purchased for $60. Speaking of washing machines, we have started a pilot project of installing 5 good machines in 5 apartments. Once it is proven that they work, it is hoped that all 60 apartments will be equipped with machines which will be a real improvement! These sisters were sure enjoying the machine that they had just received. 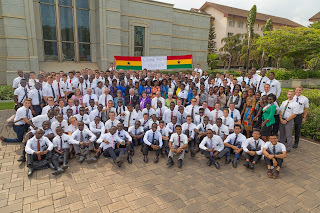 We attended the Ho youth conference the last week of August. While in the Ho area we went to the Tofi Atome monkey sanctuary and had an experience feeding the Mona monkeys some bananas. This is a termite hill. We see them everywhere. Looks like its been a busy summer! Loved those three little kiddos who liked their pictures being taken.... you should scoop them up and bring them back to me!